I’m a Thai born and bred, grew up in Bangkok but rebelled myself out of the country some decades ago and reside in beautiful Manhattan Beach, California now. I love to cook and entertain at my house, and sometimes the guests will ask for the recipes. So for a while I put recipes on Facebook, but that didn’t go well. You know, I had to accept their friend requests, then point them to the right album. And of course they still couldn’t find it! So now here I am, trying the blog platform to get my recipes out there to my friends and to you, too. I’ve found that since Thai food became so popular, there are a lot of people claiming to know how to cook Thai dishes, but they’re just guessing. The result is they ruin many of my favorite Thai dishes. ABOUT.com, which, when it comes to Thai recipes, should be prefixed with “Something we don’t know…”, is not only my biggest enemy but also my inspiration. Despite their amazing SEO, they decided to put up the shittiest Thai recipes that would make a Thai person barf just by reading them, never mind actually cooking and tasting them! My mission here is to salvage our national heritage, one plate at a time. I also travel and eat out a lot, so I have my culinary adventure journal here too. I am the sole owner of “The High Heel Gourmet”. All the pictures and recipes are copyrighted. You need my permission to publish my recipes, but I don’t allow my photos to be used. I welcome your link if you want to blog about your result from a recipes. I’m trying my best to keep this blog site as clean as possible, meaning no flashing banners and no advertisements as long as I can avoid it. Advertisers, if you don’t offer anything better than half a dollar per click, please don’t contact me. Also, if you are not related to the food industry, or you are related but don’t care about non-GMO, or organic food, please, don’t contact me. I will only consider advertisers who care about the consumers, thank you. The High Heel Gourmet also consults for recipe and menu development for restaurants, when I’m traveling to sample delicious food all around the world. My specialty is Thai cooking, but I cook many other different cuisines as well. Also, I love small, pretty things, so I do custom-designed French macarons and chocolate bon bons for special occasions. I’ve also custom-designed multi-course macaron-tastings, which start with appetizer macarons, followed by an array of savory macarons, then finish with dessert macarons. 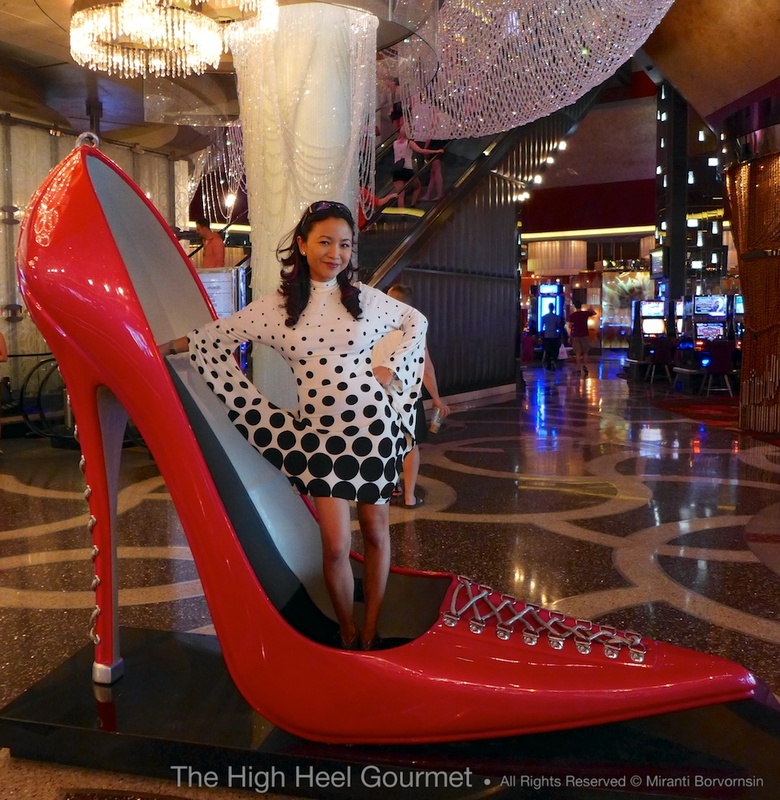 By the way, “The High Heel Gourmet” really is a cook in high heels. I’m not making any fashion statement here. I’ve struggled all my life to put 5 feet, or 150 cm, as my height somewhere officially. I finally successfully have it on my CA driver’s license, but that didn’t really make me taller, you know. So I do NEED my heels in the kitchen–not stilettos, but sensible platforms. However, “The High Heel Gourmet” who’s glamorously traveling to eat all those yummy foods never leaves home without heels. Those sensible heels don’t make it out the door…Who wants to be seen in them?…Fashion statement is needed there. So, if you see someone on unreasonable platforms or stilettos, standing in line at a famous food truck or street vendor’s food cart, that might be me. I discovered you by accident while looking for a basic pear jam recipe. Your site is extraordinary. I love Thai food, but I live in a religious community where anything that “exotic” could prompt a rebellion. Besides, I don’t get to cook that often. Still, I’ve told cooking friends about your blog. And I want to thank you for your jam blog. The information given there is so much more helpful than blind-follower recipes. I cooked a pear jam with some candied ginger in it. I got what I wanted: a loose, French-style jam. Thanks. I’m glad. And making your own jam, you can also pick your own sugar too. You do not need to consume white refined sugar. There are so many options these days. Hi Mira! My name is Sandie and I’m the Content Manager at SideChef, a revolutionary step-by-step cooking app that helps everyone cook with confidence. We initially reached out to you a few months ago because we love your recipes on High Heel Gourmet and would love to invite you to become one of our Content Partners. Since I didn’t have an email address to reach out to you, I decided to write in on your blog. Food is what brings people together, but having menu ideas can be difficult at times. Your vibrant and fun recipes really grab your attention and make your mouth water and I know many more would love a crack at making them. If I’ve piqued your interest, please email me at sandie@sidechef.com. A pot of curry can be done a day ahead (don’t put any basil leave until before serving time), chicken with cashew nut, meat with garlic and pepper can be done that morning. Larb, bake prawn with glass noodle, crispy rice and pork, shrimp, peanut dip (Khao tang na tang) can also be done ahead of time. I don’t recommend any stir-fried noodles. You can also try the hot pot, the kanom jeen (rice noodles with sauces). The one plate dish like barbecue pork, chicken and rice are also easy for party. I live in Sydney and love Thai food here – although some establishments can be hit and miss! I adore cooking and am always looking for authentic recipes. Found your blog when I was searching for a Choo Chee recipe. Glad I found you! Found your blog by chance and loved it! I’m really glad I found your website. I’ve been trying to find authentic Thai recipes for such a long time now. And I’m happy I found the ones you’ve put up. I’m pregnant with a little one due in May and have been wanting to learn how to cook Thai food for him or her, the father of the child is Thai… but he doesn’t know a lot of the recipes like his mother does because of him being raised in America with out his mum for so long. Anyways, I was wondering what kind of street food, or just food in general that children tend to lean more towards with Thai food? Or if I can ask what was you’re favorite food you liked as you were growing up? The basic every children love is the meat with garlic and pepper (I have recipe with pork but you can substitute with chicken, shrimp or beef. The very classic is omelette and rice. As a grown up, the comfort food is the meat with basil leave I have the recipe using bison. Also the Chinese barbecue pork is also very popular among children too. Chicken and rice is another simple dish and eventually I will put a recipe of clear broth soup with vegetable, Tom Jeud. I’ve been traveling and starting a project. I haven’t been blogging as often. So, try those recipe first and let me know what’s your husband think. This looks AMAZING! Drunken noodles is my favorite thai dish, but every recipe I see it doesn’t look like how it looks in restaurants. It looks closer to pasta. Yours is the most appetizing one I have found, looks so glossy and spicy! I’m going to make this tomorrow for dinner! I’m very excited =) Unfortunately I don’t have access to a carbon wok, hopefully I can still make it tasty with my aluminum one! Aluminum is ok, make sure the wok is hot all around before you start. Hi Miranti, love your blog and recipes! How can I contact you if I would like to blog about one of your recipes? You can also reach me fast with Facebook page. I check that more often than the email or this blog comments. Excellent is the word Miranti. Allow me to introduce myself. I m Sowmya, technically a nutritionist, a new mom now and I live in Singapore with my hubby and little angel. I loved the way you have written the post. Are u a nutritionist? Just curious to know. And… I second your opinion about using pectin in jam making. It’s very true that many fruits are natural source of pectin and can be substituted with the commercial store bought ones. I really get pissed off with many people who think they are self proclaimed health experts and argue on these facts. I appreciate your efforts in taking time to write such a detailed post and not missing out on points. Keep rocking and I’ll come for more. And I absolutely loved your jam pairing concept. Hi Sowmya nice to know you. I’m not a nutritionist but I studied a lot about nutrition (with my Science background it’s not that difficult to understand especially with a good text book) out of curiosity and attempt to keep myself healthy. I am so far from calling myself an expert in anything beyond Thai cooking. I love good food and good tasting without sacrificing my health for it. Just stumbled onto your blog looking for Kee Mao recipes…. so glad to have found it! Thanks for sharing your recipes! Amazing Blog ! I simply love it …. and this is actually your name blog that made me stop by 🙂 Nice to meet you ! I found your website when searching for a drunken noodle recipe..while I was literally standing over the produce at the Dekalb Farmer’s Mkt. I have made 3 times since and it gets better and easier every time. I also tried the Northern Thai Noodles and while I don’t think I nailed it, it was delicious. Do you have recipe for yum woon sen? one of my favorite things to get at my local Thai restaurant and would love to make it. You can always go to home page that show pictures of the dishes or simply do the search on the site. If there is any recipes you want, you can request here or go to my Facebook page and request there too. great website. I have a couple questions on “spicy noodles”. This is a common listing on many Thai restaurants and I am having a hard time figuring out if this is the “drunkard” noodles or something else. Usually they have less protein or meat that your recipes and it is a wide noodle. I know it has basil but not sure what the heat is from. The more I look up the more confused I get! There are a few really good Thai restaurants in San Diego and I just want to be able to recreate the spicy noodle dish at home when I need my “fix”. Also if you are ever in the area the mira mesa area has some really good Asian restaurants and markets. Emily most likely they’re the “drunken noodles”. If you follow the drunken noodles recipe, you should get it pretty close to the restaurant version. Thai restaurants here have their own version of drunken noodles base on the customer expectation. Some use Sriracha sauce, some add many others vegetables, some use “Balkan chili”, the Malaysian/Indonesian chopped red chili in vinegar and shrimp paste, most of them use Thai sweet basil (horapa) instead of Holy basil (krapraw) but the basic are from the same drunken noodles served in Thailand recipe that I published. You can take a picture of your favorite drunken noodles or spicy noodles and post it on my Facebook fan page. I will try my best to see if I can mimic it. Definitely if I go to San Diego, I might try that. Awesome mak ka Pi, i see alot of bad recipes on the internet and makes me cringe when they label it as thai!!!! Sud Yod!!!!! Thank you for all your hard work ka, looking forward to the different Kai Jieos series, i really learned alot mak mak!!! Hello! Wow! You have such an interesting blog! I made gingered pear preserves last night, for the first time, and it wasn’t bad! My husband ate half of a jar this morning, so I guess it’s edible! 🙂 I think I cooked it a bit too long (it’s a little dark) and I should’ve mashed the pears up a bit…they didn’t break down as much as I would’ve liked. Also it is really sweet with 50% sugar…will definitely go down to 30% next time…and there will be a next time as it really didn’t take long at all and it was fun!!! Your directions are super! And I totally agree with your philosophy of all organic, low sugar, etc. I’ve always been intimidated by canning but it wasn’t hard at all…I really like the oven sterilization technique. Nice. One thing that would be helpful is some timing info…I didn’t realize it would take only 30 or so minutes of cooking, at least that is what I remember. I read somewhere else it takes 1.5 hours to make jam so I was hesitant to pull it off the burner. But I did the plate test and it was obviously set. I’ve been thinking of interesting combinations with pears since I have a fridge full of them….do you have any pear-based favorites? Also, I want to order the jars you use, since I think the Ball jars are ugly! Do you use the 6 oz jars? Just curious, as a pile of pears ended up being only 5 of the 8 oz Ball jars! I’d like to make these mainly for some gifts, and that seems like it would be a nice size. Oh yeah I love the sea salt addition…it makes sense! Thanks so much for sharing your knowledge!!!! ps. I am posting this comment here since I wasn’t able to post a reply after your jam post…it just wouldn’t take my comment! I tried pear and raspberry but not mixing them together. I did it in layers. Pear needs to be paired up with some sour fruits. How about passion fruits? I actually love your idea about paired up with ginger. Caramelized pear isn’t bad. You just gave another flavor to it. Pear is so mild in flavors. BTW I have to go back and read it again about timing because I always tell people not to jam any fruits more than 30 minutes. It would turn jam to a fruit stew without flavors but apples or pears are the exception. Those are the one you can caramelized them and they came out delicious, even more so than the proper jam. The jars I used are called Victorian Square jars from I think SKS bottles (I answered with link on a reply in the jam post before). I used 6oz. size to give away as gift so I can give several flavors as a set. I have a lot of spammer in the last few months so I have to moderate every comments now. Some people even spam my blog with foreign language! You add the herb by calculating the time when is it going to release the aroma and not losing it. Like mint, you add it very near the end because the heat from the jam would cooked it so fast nearly burn it. The all spice or other dry herb you add earlier, once the jam has been reduced down then you add the spice. You time them differently. Sorry for all the questions!! One more…can you reuse the lids on these Victorian Square jars? Just curious! Thanks! I do reuse them. As long as you don’t force them open with tools, they still seal and pop properly. I have recently returned from living in Chiang Mai and I miss my local noodle bar desperately. Do you have a recipe for – Gway teow tome yum menow with choice of meat. That is the best translation I have. I have the Thai shown in a photo. I have looked everywhere and I can’t find it. Guay Teow (or Guay tiew) Tom yum manew is mean Noodle with lime. Tom Yum is the spicy broth. You can use my recipe for Guay Tiew Moo that I publish about two weeks ago and use a lot of red chilli flake with lots of lime for seasoning. Also don’t forget the peanuts. Let me know if they are close to the local noodles you missed. The best thing is show me the picture of that Guay tiew, so I can see exactly what it is. Sometime Tom Yum will have a red sauce too. Love the site. I was wondering if you had any recipes for Tawd Mun (I think thats what its called). It was a fried shrimp and chicken dumpling I had once quite a while ago. I had a recipe for Tod Mun Pla the fired fish cake (https://highheelgourmet.com/2013/06/21/thai-fried-fish-cake-tod-mun-pla/) but my guess is you are looking for the recipe of Tod Mun Goong the fired shrimp cake. I will post that recipe probably in August then (sorry so many request and I’m traveling a lot right now). It is quite scary recipe due to the pork fat used in the recipe. Can you show me or send me a picture for the chicken dumpling? And also this Tod Mun? The chicken dumpling is quite questionable. Are they looking like Guyo-Za? I don’t have a picture but i can tell you it was about the size of a golf ball. It was a combination of shrimp and chicken ground into a meatball and places in a dumpling dough then either fried or steams. It tasted alot like a very sweet fried chicken. Excellent blog. I love the authenticity factor in your recipes and the detailed descriptions. Its almost like attending a thai cooking class :). The northern style isn’t it? Which squash? The yellow kabocha pumpkin? If that what I thought you just mix flour with curry paste. I would use Kaeng Kua curry paste or you can use red curry paste in the market. One teaspoon to a cup of rice flour then add water a little at a time. Until you get a thick paste (I will have to try making it and measure the amount like the way I do to every blog because I never cook with measuring cup in general). You can add salt and a pinch of sugar too. Then fry them in medium heat. I will put this in the queue and might post the recipe by June. Yes, this is exactly the recipe I was looking for. Any other type of squash or vegetable that will go well with the same curry flour batter? Looking forward to your blog on this recipe. Banana blossom, potato, taro, sweet potato are the most common. I think they do it with wing bean, long bean, ooo squash, Thai eggplants too. If you don’t want to participate please just ignore the above! Yes, Alfredo please do 🙂 Thanks for visiting and compliment. I love your curry (Green and Red) recipes! I was in Thailand in March for a month and spent one day in a Bangkok Thai cooking school: http://www.bangkokthaicooking.com/ . The use of different spices and herbs is really an art form in Thai cooking. Good work! ah your blog is incredible! I just founded… not gonna lie, high heel gourmet is one catchy name hahaah. Thanks for posting! Love Thai food! Hello there! Thank you kindly for liking my post “Shrimp Spring Rolls”. I adore Thai food and enjoyed eating at a Thai restaurant with a friend yesterday evening. I have mentioned you in my latest post (http://hariqhuang.wordpress.com/2013/08/30/the-wordpress-family-award/) as one of the bloggers who have biggest impacts on me as a blogger. I have nominated you for the WordPress Family Award. Congratulation to you for your fine blogs as well as your warm and generous spirits. Please refer to this page on my blog for the details of the award. Korb kun krup for liking my post about “creative” restaurant names! Seen anything similar in California or Thailand? Cheers for liking my BuildingMyBento post about Bandung! Do you know of any universities in Thailand that are worthy of a visit just for their architectural splendor? I believe they would enjoy this blog, as much as I do. I try to think of people I know in OC but I don’t know any caterer there but I’m going to ask the owner of “awesome sushi” in Long Beach to see if they will be interested to catering a party in OC. How many people? She’s calling some of her dish Thai but it is really not an authentic Thai food but taste acceptable. Too cute! I’m all about wearing the HEELS, too, girl! Love your blog. And thanks for the follow! Have a wonderful day! Sawat dee ka Miranti, thanks for checking out my blog. I’ve cooked in Thai restaurants here in Roanoke, Virginia for about 5 years and have had the best time cooking at these places. I also work at an American restaurant as the kitchen manager, You have a wonderful blog that I’m slowly perusing through. Keep up the great posts. Sawasdee ka…I love you blog naka. It’s so funny. I’m a big fan if the “board of love” now. Can the board of love has its own Facebook page ka? I assume that you are not Thai. Are you? Are you cooking Thai food? I might have to sit down or lie down and read your entire blog just to find out your name 😉 Thanks for liking my blog. I used to live in Alexandria and Burke, VA. I went to Roanoke a few time but never try any Thai restaurant there (this was twenty years ago while I was still in college in DC area). Miranti, my name is Sheila and no, I’m not Thai. A few years back I fell in love with Thai food and decided to learn more about it. What better way than to hang out with Thai cooks? So I went to what then was the only Thai restaurant in town and asked if I could do dishes or some prep in exchange for learning a little about the cuisine. Next thing I know I’m working 70-80 hours a week learning everything from dumplings to curry pastes, The fact that absolutely no one in the kitchen spoke English made the experience that much more fun. We now have 5 Thai restaurants in town and I help out when cooks need time off or positions need to be filled temporarily. I have been blessed to have been taken under the wings of some truly talented Thai and Lao cooks and chefs. One of the chefs had actually cooked for the royal family and so I learned a bit about the Thai royal cuisine. Thank you for your interest in my blog. The header picture is of my favorite wok. As you can see it has taken quite a beating during my time learning how to cook with it. I’ve already picked up a few pointers from your blog that I haven’t seen before. Look forward to more. Sheila…the wok looks well worn indeed! Cool that you are interested in Thai cooking. I hope you get paid these days now 😉 You probably more experience than me in a commercial kitchen. The royal cuisine is very delicate and time consuming. I made one dish called “Kao Chae” which is cooked rice in flowers flavor cold water (summer dish) and accompany with five six different things. I have to make those accompaniments one item at a time. It take a day to make just one thing so it took me five days before I get to eat my Kao Chae! That’s the royal cuisine. I’m glad that my blog can add to your knowledge. It is pretty basic so my inexperience friends can cook the dish on their own. If you have any questions about Thai cooking, please feel free to ask via email or Facebook (I respond faster that way). If I don’t know, I will go ask the gurus in Thai cooking that I know for you. I am messaging you to ask for your permission to print and distribute your Steamed Garlic Chive Dumplings/Gu Chy Gui recipe on little handouts at the 5th annual Gaginang conference entitled “Our World, Our Story, Our Time.” If you are unfamiliar with us, Gaginang is a nonprofit organization that promotes the culture, language, and identity of Teochew around the world. This year the conference is help in Seattle, WA. I thought it would be great to have a cooking demonstration during the conference so attendees can try to keep some of our Teochew culture in the kitchen. This dish is definitely a favorite! Just to clarify, we are not making any money from this recipe card distribution. Please let me know your thoughts or if you have any other recipes you would like to contribute that are of Teochew culture! I would be happy to answer any questions as well. Yes, you have my permission. Please, add the source link (https://highheelgourmet.com/2012/02/19/gu-chai/) on the print out somewhere too. Just in case people want to find out more about some other recipe such as Jung (https://highheelgourmet.com/2012/06/24/bahjang/) or etc. I hope it’s not too late. Sorry for the late reply. I have been so busy with the new post and didn’t check my email until now. Hey your recipes look pretty great I’m looking forward to giving them a go! Thanks so much for visiting my blog and the like on my page. You are so keen on cooking Thai food. I really like your “Thai Curry Paste Episode”. Your blog is very fantastic. I like it! ’m nominating you for the “Versatile Blogger Award”. You can check the rules to accept the award & share this award through the link here – http://kelipaan.com/awards/. First off, I love Thai Food (a little biased because I am Thai and my family owns thai restaurants in los angeles haha) and secondly THANK YOU for following our blog! We wanted you to be one of the first to know that we are launching an event website called wigo events. Our site focuses on a community of users in Los Angeles sharing cool events that they know about, and we would love to have you be a part of it! If you are interested in being one of our very first users please leave us your email address at the link right below, sorry its so long, don’t know how to add a hyperlink in the comment section haha. Once our site goes live in the next few months, we’ll let you know! Your beautiful soul and infectious smile add at least one a foot of pure enjoyment, that can never break like a heel can. What a fun and fattening blog you have, I love it……. Hahahaha…true. You have o have strong leg and core muscles in order to walk comfortably under complete control…but I use to it. It’s the only way to see people eye to eye for me. Hello Neighbor! Manhattan Beach is my playground! Wonder if we ever ran into each other! I have family in Manhattan Beach! Thanks for following! Nice! Manhattan Beach is nice but only draw back is not enough good Asian food around. It’s a convenience location for someone who travel so often because it’s so close to the LAX, only 10 minutes away without the noise. Thanks for liking my post Lunch Date at Hock Lam Beef! I love the photos in your blog! Awesome website. I loved seeing Vegemite in your recipes 🙂 Keep up the wonderful life. Kab koon krup for liking more of my posts, Miranti! Do you prefer window or aisle seats? Also, can you get Tipco products in California? Window ka. I also don’t care about Tipco even though the broccoli juice is kinda interesting but most of their juice didn’t taste that good. Some of them even from concentrate! I don’t think they export the juice to CA. Thanks for stopping by my blog! Please follow me 🙂 Your blog is gorgeous! Can’t wait to dive in. Great Tom Yum post! Thanks for stopping by Savvy Single Suppers! I have the opposite problem, I’m usually too tall for my counter heights . . . no heels here, lol. I love the illustration in your header. Very chic. It’s wonerful to have authentic recipes to follow when, as a Canadian, I attempt other types of cuisines. Have fun with your blog. Thanks Susan…I which I have your problem! I have to stand on a stepping stool when I roll any dough…embarrassing, you know and I love to make my own Croissant too…imagine how many time I have to step up and down. What”s part of Canada? I actually LOVE the food in Quebec the most and in August, I’m going to spend 5 days in Vancouver. I’m looking forward to it. I also really like fruits there very much. I had wild strawberries in Montreal Chinatown and still remember the taste until now (it was about 20 years ago). Thank you for visiting my site and liking my “Silkie to the Rescue” 🙂 Your food blog looks amazing! I’m definitely going to follow and try your recipe! Thanks…I like your new post the Japanese sea bass with Ginger too. Beautiful picture. Hi there!! Thanks for the like on my page! Your blog is so amazing 🙂 I love Thai food so much and as I step out of my baking comfort zone and into cooking, I am so glad I found your blog (or rather you found mine!) I look forward to trying many of your recipies! Thanks for a kind compliment. Looking forward for more baking recipe from you. BTW I’m trying to develop a bacon, macadamia nuts shortbread bar with dulce de leche and chocolate (millionaire style bar). Do you have any interesting recipe for that? I LOVE shoes (what woman doesn’t?) – impressive that you actually cook in heels! Thanks for visiting my blog too. lol…it’s necessity for me, you know not only fashion statements. I can’t even look INSIDE the stock pot on the stove without heels! Thanks you too have a great weeks. Thank you for your repeated visits to simplydaisies! Love to read your work! 🙂 I sent your recipe to a friend of mind. She had just converted to a vegan and almost fell out because she ran out of idea to cook for herself…thanks for the delicious recipe. Yes, substitute vinegar for tamarind pulp and brown sugar for coconut palm sugar. My recommend is don’t buy the premix sauce, make your own and with these 3 ingredients, you can store the mixture in the fridge for a long time. Hi! Thanks for liking my blog post. Your food posts are always nice and I can almost taste the dishes just looking at the photos :). I am visiting Thailand this June, and look forward to having authentic Thai food. Bangkok and Phuket. Can’t wait, and would love to know from you which places I should definitely not miss. Ok in Bangkok, are you going to eat street foods in the carts, restaurant without AC or in restaurant away from the tourist attraction spot? Yes! I would love the authentic street food experience and am not afraid to experiment :)! Sukhumvit Soi 38, take BTS train to Thonglor station, exit the opposite side of Thonglor. This is a great location for street food, mango sticky rice, padthai, handmade noodles with barbecue pork. Lumpini park in the morning. BTS Ratdamri station (sorry for my spelling of the name. I don’t remember English name) and walk or the underground train to Silom station. This is the breakfast Thai-Chinese style. Walk around Lumpini park is fun too, small but it’s served the same function as Central Park. Aor Tor Kor market. There are a lot f food vendors. you can try so many stuff. BTS Jatujak station and walk. Visit Jatujak is fun but it’s only open on the weekend. Wow. All of it sounds amazing, and can’t wait to explore! Thanks :)! BTW Did you already plan the accommodation? Yes, we are planning to book by early May. Hope that is not too late. Depend on where you go. The school term already started so it should be ok. Novotel Siam Square is the nice place to stay but Ibis not so far from there is cheaper $60/ night unless you want to go cheaper than that. This is for BKK. This is going to be a long process. Do you have Facebook? Friend me if you do at Facebook.com/Miranti so you can reach me faster. Phuket I would pick something remote patong beach will be too busy but what do you expect as an experience? Hi Miranti. I appreciate you taking the time to give me such a helpful and detailed answer. I am travelling with 2 other friends (one guy, one girl). They will be there for 5 days and then leave. I would be there for 5 more days in Phuket. I want to travel to see the place, have local food, do snorkelling, hit beach parties and check out the nightlife. Have messaged you on facebook. What would you recommend as an experience? Thanks for stopping by my blog! Your recipes are making me hungry…even though I just ate! Can’t wait to try making some of your creations! Hi Miranti, thanks so much for visiting my site and the Doodles with Noodles! Whilst my Noodles don’t taste so good as yours, they are fat free, sugar free, cholesterol free and full of fibre! Quilting is delicious!! lol…you are funny 🙂 Thanks for visiting, keep quilting. Hi, High Heel Gourmet! Thanks for liking my GreeNoodle with kimchi entry! I find your photos to be top-notch!! ABC Foodie. I found your blog is very entertaining…keep it up! I love it when you wrote about “those so call chef” too. Many thanks for liking our post Mouth and Body Connection. It’s always fun to discover new things especially something related to our passion – food ie organic food! We’ll try some of your recipes here. Come and visit us again next time! Wonderful site! How could someone not follow a blog with high heels as part of the title. Looked around and loved it. Looking forward to the fun. There use to be an Asian market owned by a nice Thai lady north of the Stratosphere that you can get all Thai ingredients. Ranch 99 in Chinatown should be another good place too. I used to live in Las Vegas a long time ago (before year 2000). If you have problem finding ingredients, let me know. I can ask my friend who lived there. Funny I’m in Las Vegas right now while I respond to your comment. I was just taken pictures with the same red shoe at Cosmopolitan Hotel again today! I wish I can be that confidence! When I’m not on heel, people just don’t see me and a lot of times, they just bump right at me, step on my foot or worst! Hello, thank you for dropping by and liking my Red lentil Dahl. Hi, Thanks for taking the time to read our blog and like the posts, I’m glad you enjoyed it. Your blog is great, what delicious food!! Thanks for the like at simplydaisies. Thanks for stopping by my blog, checking out the recipes. Great single high heel in your picture. If you can wear high heels graceful, good with it. I am the opposite in height, quite tall. Great reading about your travels and food enjoyed. Thanks for visiting me back. I went to your site looking for herb to help ease my cough. Love your blog and now envy at your height too. I wouldn’t wear heels as much if I’m only half a foot or may be 10″ taller…I’m not asking for too much I think…I wasn’t even asking for a whole foot stretch! Just partial. Thank you for dropping by the blog! Thank you so much for your wonderful response to my blog! I really appreciate it!!! Looking forward for more post from you. I LOVE Cuban food. Thank you for visiting my blog and liking my recipe for Banana Coconut Oat Pancakes. I can’t wait to look over your recipe list. P.S., your blog name is GREAT! 🙂 Thanks for visiting me too. I have a gluten free vegan guest that I have to cook for sometime. I like your blog. I love your story, I can relate as I am also a 5′ gal. Thanks for sharing your recipes! Thanks for stopping by my blog and giving a thumbs-up to Sweet and Pungent Curry! I have lived all my life in (mostly rural) Canada, though I am in Toronto now. So I only came across Thai food about ten years ago. It has quickly become my favorite style of Asian cooking and I am delighted to find a collection of authentic Thai recipes I can try. Thanks for “liking” my Thailand posts. Your home country is beautiful and the food is great! I will have to try some of your recipes. I’m envy you were just there…eating all the yummy foods and fruits! Thanks for hopping into my blog. Reading this page was pretty hilarious – witty in a very subtle way. Will be hopping in a lot, considering that I’ve just learnt to cook Thai food. Don’t mind making it a bit Thinglish too! Thanks for empathy with my need for high heels (of course you do right…hehe). I’m following your “unblogging” now to get all the post…don’t forget I’m watching (the two fingers poking in my eyes and back in yours that kinda move! )…lol…I’m kidding. I like your blog and Thai food can be Thinglish. Seriously it wouldn’t be as bad as a Thai would abuse your language, you know. Wonderful blog!! I will be following! Hello, thanks for stopping by my blog and liking my post. I really, really love your blog!! I’m shocked and pleased that a sophisticated food/restaurant critic like you “liked” my simple asparagus recipe. Thanks for visiting my blog. I look forward to getting many more cooking ideas from your blog. Are you kidding me? You even GROWS your own asparagus! That’s many steps beyond me and my cooking, you know. I love all great food and to ensure it, I should know how to grow them but well but I don’t. I blame it on my black thumbs. You don’t need fancy crap on your fresh picked asparagus, the way you cooked them make my mouth water! Great height to wear high heels ALL THE TIMES…great excuse isn’t it! Thanks for liking me, I like your blog too. Hi..I like your beautiful blog and I have nominated your for “The Versatile Blogger Award”. Thank you for stopping by my blog and showing some love to my post Ms. Eva. I look forward to perusing your blog for great recipes. Thanks for stopping by Mrs. City Boy and liking my post! Your cuisine is much more elegant than mine, and you take such wonderful pictures! I may learn a thing or two about Thai cooking from you — be careful way up there on those heels, lol! Thanks for stopping by my blog! Your recipes look amazing, and I love that you posted do’s and don’ts! Thanks for coming to visit my blog. I read over your thai green curry paste post and I love how you photograph each ingredient. Many people may not know what galangal looks like in its natural form so photos are essential. We’ve been to Thailand and found it to be warm and gorgeous, just like the people there! I grew up visiting your beautiful country. Loved everything about Bangkok– especially floating market and Sukhothai! Thank you for these recipes- can’t wait to try some! Thanks for liking my post. I enjoyed reading this. You made me smile. Blessings. Thinglish… that’s so funny. I’m glad you liked my post about Chocolate Cake. Thanks for stopping by, and I look forward to comparing notes on our creative kitchen endeavors. Cheers! Thank you very much for stoping by my blog and liking my food photography post. I am just starting in this area of photography and was amazed when I looked at your posts! Hello from a fellow five-footer! So funny; I love to wear tall shoes as well: in the kitchen, the playground, while sitting on the couch… = ) My husband loves Asian food, so I’ve been toying with trying to find recipes to teach myself. So excited to read more on your blog. Thanks for stopping by my blog. I love what you are doing here. Some beautiful photography and delicious looking dishes. Thanks for visiting Miranti! I had my daughter in Bangkok. 🙂 I miss the food sooooo much! Thank you again for dropping by the blog! Love your recipes very much!!! Thanks for sharing!! Thank you for visiting simplydaisies! Thanks for checking out Thymeless Sage and Random Rants. I will be spending time here and trying new recipes. K.Fah. Just have a chance to check into your blog. Omg! Terrific&Brilliant. Love it ๆๆๆ Also love the name and its origin…cute&creative. Hope to see you soon(for food). yeah agree! HIGH HEELS and good food is the way to go! come to bogota – you may not believe it but there’s plenty of gourmet here! I would love to. I already like Colombian foods. Hi! I’m nominating you for the Sisterhood of the World Bloggers Award. My post with your nomination will be up soon, and you can choose to accept or decline the award. Have a blessed day! Such an honor! Thank you so much. Thank you! It’s such an honor. Great blog! I like you love nothing more than food, wine, travel and photography so I can totally relate. I will be checking back with you. Thanks to for visiting my blog. I am very proud that my post Struffoli o Cecetti liked you!!! Thanks! I invite you to travel to Napoli during Christmas time to taste them! Hai… Thanks for following my blog, even though I acknowledge it late, sorry for that….you know what..even I am 5 ft tall only !!! and I truly understand how hard it is for us without platforms…lol.. You have a great blog here and I really love it…..:) looking out for more posts from you. Thank you…your blog is great! I love your Indian recipes. Thank you for stopping by my blog. I love thai food but am not very experienced at it. I will be stopping by your blog to learn some new tricks and hints. Growing your own is very easy. One step at a time. The best advice I can give to a new grower is to not over water them. Let them dry out just bit before watering again. I hope that you will give it a try. I love Thailand, so much. Me too 🙂 I’m glad you do. Thanks for visiting my site! I’m looking forward to trying your authentic pad thai recipe; one of my daughters has been asking for it and I’ve been looking forward to trying it. 🙂 Some recipe doesn’t need the “practice”, you know. 🙂 You are doing more than fine on your cooking there…Thanks for visiting. simplydaisies appreciates your likes!! Enjoying your blog! Thanks for visiting my blog and liking my post! Since I love to cook I will enjoy following your blog. Oh, your picture is adorable! Thank you for visiting my blog and liking my strawberry cake post. I look forward to checking out some of your recipes. I haven’t had a chance to try your strawberry cake yetbut will be this summer. Thanks for visiting my blog and like my Sweet and Sour Pork, 咕嚕肉. You have a really cool web page and so many good recipes. I am off to Thailand in March for three weeks visiting Bangkok, Ayutthaya, Sukhothai, Chiang Rai, Chiang Mai,and off to Siem Reap Cambodia before coming back home to Canada. Love to spend time in Thailand eating good foods. I’m envy at you. March might be a little hot there but I would say it still alright. If you need some tips about place to eat in Bangkok and Chiang Mai, let me know. You can contact me via Facebook, http://www.facebook.com/miranti or my Facebook fan page http://www.facebook.com/HighHeelGourmet/ Enjoy your time in Thailand. You go, girl, with the high geels! Too many people dress casually today (Onesies??? Ugh.). I never ever wear jeans. Thank you for stopping by simplydaisies again! Love your recipes! Thanks so much for dropping by Main St. Manhattan Beach is one of my absolute favorite places…lucky you! Looking forward to reading more! Your blog is well organized and very informative. I like the photos. Picture say a lot also. Well done. Thanks for viewing my blog at Savor the Food. I would appreciate your comments and readership. Hope you can follow us. Thanks for sharing and looking forward to what more The High Heel Gourmet has to post. You gott’a love that name too. Thank you for visiting my blog. I look forward to reading more from you. Love your blog :). I grew up in Bangkok as well! Great! I don’t know what year was it, that you lived there, but Bangkok had changed a lot since I was born and grew up there. Anyhow I hope you love the street food there as much as I do. I like your blog and following it, fun! Thanks for the follow. I moved to the US in 1999, but go back every couple of years. I love Bangkok :). My brother lives in Chiang Mai now. Nice! I go back every year since I moved here in 1997. So you were there during the late 80s. Bangkok was sooooo crazy with traffic back around that time. It’s before the BTS time 🙂 I spent hours on the road just going to and from school or work. I lived in Bangkapi and attend Chulalongkorn University (Siam Square). This is before the express way to NualJan Rd. I also lived in Chiangmai during 1883-84 for two years, so different than now! Thanks for visiting and liking my blog post. Love that you wear heels when cooking! I’m 5 foot too, so can share your ‘short’ pain hehe! Thanks for liking my blog post! I visited Thailand with my best friend twice in high school and I absolutely loved it. It was one of the best experiences in my life and I would love to go back some day. I especially miss the food, and your recipes look great. Go back! Thailand is still an inexpensive place to visit. I miss it a lot too. Thanks for the like on my blog. I’ve just followed your blog as I love Thai food and even though I can’t get lots of the ingredients here where I live in Jordan I will be able to enjoy it through your pictures! Thanks. I LOVE yours. I’m following your blog. In fact I’m planning to visit Turkey and hopefully I get to go to Israel and Jordan too. Since I haven’t visit Jordan yet I can’t tell you where to find or what to use to substitute the ingredients. I might be able to tell you after the trip. I though the middle eastern food is quite close to SEA but I guess only the spice. Some of the ingredients are available through Amazon too. Thank you for stopping by simplydaisies! Great stuff here! LOL My spice cabinet is so full! But I have a feeling some of the spices needed for Thai are not there, but that’s half the fun. If it’s not fun, why do it? Hi Dave Thanks 🙂 Your blog is fun to read. OK Tell me more about the sticky rice thing. Were they white rice or black or red with sugar? Did they serve with mango or on it’s own. Was there any sauce and what color? What’s the texture of it? Did it come with any porous custard? Was there any filling? I know Dave that I asked too many question but Thais made many different kind of desserts with sticky rice…lol. I try to figure out what it is. If it was white sticky rice, soft but the grain of rice still maintain its form not swollen or mushy and might served with mango or little bit of coconut cream, I would think it’s just typical sticky rice or called in Thai “Kaw Neaw Mool”. This one is quite easy to make in method. If I can tell you how to cook this, would you tell me your “mushy story” about how did you find Lucy (again), get rid of her x-fiance and get her to agree to marry you after the first turn down? Thank you for stopping by my blog and the input. Your welcome Mark! Mannnn I was thinking I would know the secret lol 🙂 BTW have you ever explore the diet called “Macrobiotic diet”? I know someone who’s cancer free for 6 years now after switching to this diet. It’s not the best tasting in the world but it works for my friend. I’ll look into this, thank you very much! Thank you for stopping by my site — I look forward to exploring your recipes! Thanks! I like your idea of making frittatas in a muffin pan. They came out so cute and you don’t have to divide them. I want to cook and shop with you! That would be fun. I can’t lift much you know. 🙂 I’m building my muscles though, just so I can shake the wok! Thanks so much for stopping by lil ole blog! As you may have read in my entry, I was a judge, and not a cook. Quite frankly, I am a little scared of cooking! I can bake, but cooking the main dish of a meal is fairly foreign to me! Your site looks like a resource that could make the kitchen not such a scary place after all! lol…I would be so scared in the courtroom and rather be cooking there instead of sitting and listening. I don’t even like it even though I have to go in for traffic ticket. I’m actually opposite between cooking and baking. I used to don’t like baking because I have to “measure” the ingredients. I got better after trying to make macarons. I’m now making croissant and whole nine yards. So, I think, judging from your career (which is much more intimidating but you had done well), you would feel at ease cooking five courses dinner soon. Oh goodness! I have confused us both! Hah! I meant that I was a judge in my friend’s Iron Chef (cooking) competition! I am not a professional judge! For work, I am a high school English teacher (so I should be able to express myself more clearly, huh??). I certainly would be petrified in a courtroom! Hah! I agree though, i think I like baking because there are very specific rules! Thanks for liking “doctored steak” and for your insight on food. A long time ago – long before I became diabetic – I was fortunate enough to eat great Asian food in great Asian restaurants in Asia. The memories linger and are treasured. I’m also 5 feet, should try to cook in high heels and see how it feels 😉 thanks for sharing interesting details of your culture in your recipes! Thanks for visiting my new blog! I remember a day once upon a time when I too used to live (and cook) in heels. Alas, three young children have cured me of that habit! I specialize in regional Italian food and own a catering biz in Queens, NY. However, I love eating at the many super-authentic Asian restaurants nearby (some people call downtown Flushing, Queens the epicenter of delicious Chinese food). Look forward to following you! lol…children they strip you down and refill you with new attitude and new agenda in life but they’re so wonderful aren’t they. I wish I have one of my own too. Unfortunately I had so much good time and by the time I was ready, my biological clock had decided to stop early! Glad you liked my blog. I enjoyed reading yours. I hope you have a chance to try some of my recipes, I will be trying some of yours. You made me smile about your height: I am tall, but my daughter is short like you and loves high heels. I might try the grill romaine salad. I had it at a restaurant one time and thought it was good but forgot about it until I saw yours. I actually have to come up with a “diet recipe” for my husband too but anytime I make him salad (he request no carb diet), he end up eating nuts or ice cream afterward. Then the “diet” goal fly out of the window! Thanks for checking out my recent Flourless Strawberry Pancakes! I hope you find some of the recipes on my blog easy to recreate for yourself as well! I look forward to following your baking and heeled adventures in the future. I likes reading your recipes & may try a few of them.And yes the high heel in the photo is cool. I’ve awarded you the One Lovely Blog award. Read all about this award here. I hope you are having a blast in Paris….Ahhh…what a magical city. Hi Patty…So sorry for the late reply. I had just came back and now ready to get the blog rolling again thanks so much for the nomination and I will get this on as soon as I can. lol…Thanks…glad to know that I’m not the only “tall chick” in the kitchen…Aren’t you love the platforms? I so don’t want them to go out of style at all. I’ve been enjoying your Tokyo ones, as I have never been there. Have a safe trip. lol…Thanks…you sound just like my foot doctor (actually he’s my friend’s husband)…yeah I’m not wearing heels while I’m sleeping though…hehe. Thanks for visiting our restaurant’s blog! Loved reading about you and your high heels in the kitchen. I think I had your vegan korean BBQ taco (or mock meat taco with asian spice that I assumed that it’s korean bbq) not so long ago. My friend said it was from “One Veg World” It was delicious. Is it something you serve at the restaurant? If that so, I will definitely visit your restaurant when I’m in West Covina. Thanks Scott! I love the pictures on your blog. Creative site! I LOVE your recipes! Thank you for sharing.